Schedule announced for 2018 US Youth Soccer Midwest Regional Championships in Westfield, Ind. FRISCO, Texas (June 15, 2018) – US Youth Soccer is proud to announce the schedule for the 2018 US Youth Soccer Midwest Regional Championships to be played June 22-27 at Grand Park Sports Complex in Westfield, Ind. 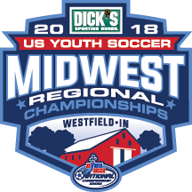 The US Youth Soccer Midwest Regional Championships, which will feature top teams in the 13U through 19U age groups, kick off with round robin games Friday, June 22, through Sunday, June 24. Following a day of rest, semifinal matches are Tuesday, June 26, and finals are Wednesday, June 27. US Youth Soccer State Cup Champions and Midwest Regional League wildcards from 14 US Youth Soccer State Associations in the Midwest Region, including host Indiana Soccer, will participate. The other state associations represented include Illinois, Iowa, Kansas, Kentucky, Michigan, Minnesota, Missouri, Nebraska, North Dakota, Ohio North, Ohio South, South Dakota, and Wisconsin. For the latest in the Midwest Regional Championships visit championships.usyouthsoccer.org/Midwest/. For media members interested in covering the 2018 Midwest Regional Championships, please find information on credential applications here.